Jen Palmer stories at Techdirt. stories filed under: "jen palmer"
We've been covering the story of Kleargear for a while now. As you may recall, the company sneakily put a $3,500 "non-disparagement clause" in its online terms of service, saying that you agreed to pay that much if you gave the company a negative review. Jen Palmer left a negative review over some stuff that her husband, John, bought that they never actually got. This happened long before the non-disparagement clause existed. Despite that (and the dubious enforceability of such a clause anyway), Kleargear demanded the $3,500. And when the Palmers rightly refused to pay up, it sent the amount to a collections agency and messed up the Palmers' credit, causing significant hardship for the couple. At this point, Public Citizen stepped in to sue KlearGear. For a while KlearGear played a disappearing game. It didn't respond to Public Citizen's initial letter, then it ignored the lawsuit (and put back the non-disparagement clause on its website after briefly taking it down). Based on that, the Palmers got a default judgment against the company. Then, suddenly, a "representative" of the company named Vic Mathieu magically appeared spouting all sorts of nonsense and trying to defend everything the company had done. Of course, neither KlearGear nor it's apparently French-based owner Descoteaux Boutiques actually did anything in court, and thus, the court has ordered KlearGear to pay up to the tune of $306,750 in both compensatory and punitive damages. Of course, collecting on that award may take some work. It's still not entirely clear who is behind Kleargear, statements from Vic Mathieu notwithstanding. It's possible that the company is really owned by this French company, which will make collection difficult for a variety of reasons. Or that whole thing may be a sham in itself, meaning that no one knows who's actually involved at all. Chances are, the Palmers are unlikely to see much money here. Still, what amazes me is that Kleargear itself is still in business. I'm somewhat surprised the company didn't just up and move to a different domain. But, instead, it's still there. One hopes that people doing some shopping do some searches first on the company to find out about its practices. The expanded statement below concludes our public comment about the case of Palmer vs. Kleargear.com. After the payment method of John Palmer was declined for an order in December 2008, he was belligerent toward our customer care staff and threatened to defame Kleargear if he did not receive free merchandise and other consideration. Even if this is true (and there's no reason to believe it is until Mathieu provides some proof of this), this doesn't explain why nothing was pursued until 2012 (something Mathieu points out in his previous "final" communication), conveniently after KlearGear added its Non-Disparagement Clause. Such a customer behavior is rare but it has become a increasing problem for many companies today. DBS' head of retail for North America, Lee Gersten, spends nearly half of every year in the United States and Canada and cites this problem as one of the reasons that we started to eliminate Kleargear.com's social media channels in 2012. First off, shouldn't the North American "head of retail" spend more than "nearly half" the year in the area he services? Secondly, the social media channels didn't go dead until late 2013, shortly after the Palmers' story went national. Either KlearGear's social media handlers are grossly incompetent or this is nothing more than desperate revisionism. While buySAFE protects our customers' interests on every transaction and can confirm that our rate of dispute is below 0.1%, less than 1 in 1,000 customers, this track record is not public and dissatisfied consumers have a stronger voice. I've reached out to buySAFE for confirmation on this claim. I will update when an answer is received. The non-disparagement agreements are not new among employees, partners and customers across the globe. The fact that other stupid companies and people exist doesn't make KlearGear's policy any less stupid. There is no contract of adhesion; Kleargear.com operates in the consumer discretionary sector, which does not provide essential services, so that consumers are free to shop elsewhere. Our sales contract is enforceable under the laws of the United States because business transactions are exempt from First Amendment rights. Except that you would need to complete a sale for it to be enforceable (and even in this case, it's far from a foregone conclusion). The Palmers never received the items they ordered, so no "sale" was actually made. It takes two parties to make a sales contract enforceable, and KlearGear didn't hold up its end. In our opinion, the arguments and the actions of Public Citizen's Scott Michelman are irresponsible and uninformed, at best, and constitute an abuse of process at worst. Mr. Michelman seems to be an unscrupulous attorney who has made considerable efforts to incite a biased "media storm" to hide this fact. I'm sure angering the opposing attorney is sound business decision. [eyeroll] And Michelman had nothing to do with the "media storm." Since Mathieu can't seem to keep up, I'll provide a short point-by-point timeline. First the storm -- then the lawsuit. Despite this tactic, or perhaps because of it, Kleargear's revenues in the third calendar quarter of 2013 increased by 124% compared to the same period in 2012 - and revenue for the year to date in 2014 is up 72% compared to 2013. If DBS is presented with an order for judgment on the above-mentioned civil action, which is void on the basis of defective service alone, we will not honor it. Might want to reread the Hague Convention. As pointed out by a commenter in the last article, it appears DBS was properly served at KlearGear's Michigan address. "Another proper method of service is to serve a subsidiary corporation. ... Service within the forum state is not governed by the Hague Convention." In addition, such an invalid judicial resolution will not serve to dissuade Kleargear or other retailers from binding their customers to non-disparagement terms. If and when Mr. Michelman and Public Citizen decide to conduct themselves properly, we will participate in this dispute as any honorable corporate citizen would. You wouldn't know the meaning of the word "honorable" if it slapped you with a $3,500 non-enforceable fee four years after it failed to deliver purchased items. Mathieu claims a stellar customer service record, but its customer service has been routed through Zendesk (who I've also reached out to for comment/information) and its policies related to customer service matters range from the questionable to the abusive. forward your account to our external collections agency and assess an additional $500.00 Collection Fee. Any dispute also carried with it the chance that KlearGear would report the customer to BadCustomer.com. The only thing preventing KlearGear from doing this today is the fact that BadCustomer.com was shut down by the FTC for participating in a billing scam that extracted $275 million from credit card users' accounts over a 4-year period. Here's how its chargeback policy works in practice. Due to a recent dispute filed with your credit card bank in connection with your Order #29296 on 11-Sep-2012, you now owe an additional $50.00 per our Chargeback/Dispute Policy that you agreed to at the time of your purchase (available here: http://www.kleargear.com/help.html). If you do not pay this fee within 30 days of the date of this notice, your delinquent account will be forwarded to our collections firm, credit bureaus TransUnion, Experian, and Equifax, and you will owe an additional $500.00 Collections Fee per our binding sales contract. To pay this fee, please fax a copy of both sides of your credit card to our Legal Department at (210) 745-421 and reference your Order #29296. Alternatively, you may send a check to us at the address below. We regret that we must charge this dispute fee, however your dispute violated our sales contract and was premature and without merit. Once again, please be aware that should you dispute your chargeback fee or later cancel a check payment you will incur additional chargeback and collection fees. A copy of this message is being provided to your credit card bank in connection with this dispute and the related chargeback dispute fee. Whether or not you cancel your dispute with your credit card bank, this dispute fee is not refundable. Please be advised that you will not receive another notice regarding this debt before your account is forwarded to our collections agency. A look at the pre-Jen Palmer complaints to Ripoff Report shows a distressing commonality: KlearGear likes charging credit cards -- shipping products and/or answering customer complaints, not so much. Multiple customers report that phone calls and emails went unanswered. But if someone decides to issue a chargeback after waiting weeks for their purchase, KlearGear's "legal department" swiftly springs into action to threaten users with hefty fees and damaged credit ratings. Until Mathieu is actually willing to provide some proof of the claims he's made, the company's online reputation will continue to speak for itself. KlearGear's relationship with its customers is toxic. Mathieu has invited everyone to shop elsewhere. I say take that offer. Well, this is interesting. After months of dead air, the person behind the company behind the thin-skinned thug d/b/a KlearGear has finally issued a statement on its decision to charge a couple $3,500 for posting a negative review, along with ruining their credit. In an email sent to Ars Technica (and other sites, apparently), Vic Mathieu of the France-located Descoteaux Boutiques claims this company, the purported owner of KlearGear.com was never "served properly under the Hague Convention," and will be seeking to vacate the recent default judgment against it secured by Public Citizen and its clients, John and Jen Palmer. With the company's twisted history out of the way, Mathieu goes on to claim that the Palmers did agree to the Non-Disparagement Clause (and its $3,500 fine) when they purchased items (that they never received) back in 2008. The structure of our sales contract, referenced in your order check-out screens which we have on file from December 22, 2008, had three forks (today there are two): http://www.kleargear.com/help.html, http://www.kleargear.com/termsofuse.html and http://www.kleargear.com/tsaddendums.html. The problem with this assertion is that it simply isn't true. The Internet Archive has no record of the TSA Addendums URL. It could be that IA was blocked from archiving it or that it was active for such a short period that it was never crawled, but a look at the history of the site map shows that page didn't exist in 2007 or 2009 -- or any other year. Here's every KlearGear URL archived by IA. It's not in there either. (Yes, I scrolled through 5,000+ URLs.) It could be that the Addendums were served via a Java popup or something similar but Mathieu clearly specifies a URL. He also claims to have "record" of this being agreed to by the Palmers, but apparently "forgot" to attach that piece of evidence. Mathieu is claiming the Palmers agreed to a non-existent clause on a non-existent page in 2008. The clause still wasn't present when Jen Palmer wrote her negative review in 2009. The Palmers heard nothing about it until 2012 -- not coincidentally the year the Non-Disparagement clause debuted. Mathieu declaring this self-serving email to be KlearGear's "first and only statement" ensures he can never be called out for lying. But Mathieu's not done making things up. Kleargear's Non-Disparagement Clause was never deleted from our online store in November last year, as it has been wrongly stated; it was simply relocated with other content on the new URLs (the aforementioned clause can now be found at http://www.kleargear.com/termsofuse1.html). Mathieu wraps up the letter by playing the most pathetic of victim cards. Ironically, if Mr. Palmer had simply approach Kleargear first last fall and requested a stay to finance their new furnace -- we would have worked with him. We are human beings. Instead, he has chosen a public forum. Really? Because there's plenty of evidence out there that Kleargear (and its multiple associated companies) are completely unapproachable. Not only did the Palmers try to contact the company, but so did several others. From the original story by Matt Gephardt at KUTV. When we tried calling Kleargear.com we were unsuccessful in getting through to anybody. By email, a person who did not identify him or herself defended the $3500 charge referring again to Kleargear.com's terms of sale. I tried to get a comment from KlearGear. I tweeted their Twitter account. I left a message on their Facebook page. I repeatedly called "Rob Key," their "Media Relations" person, at the number they provided; it was constantly busy over two days. I called the main number on their website; the recording always says that a customer representative is unavailable on this time and to check the website. Neither KlearGear nor Descoteaux Boutiques responded to repeated requests for comment via phone and e-mail. A call to the Paris number listed on the e-mail for Descoteaux Boutiques resulted in an automated message in Canadian-accented French and then English saying to call back during European business hours, which Ars has already done more than once. The BBB contacted the company at the Michigan mail drop address instructing the company to immediately remove the incorrect BBB logo and reference from their site. While the company did not respond to the BBB, all references to the BBB has been removed from the company's website. Mathieu also claims his company was completely blindsided by news of the lawsuit's default judgment, claiming Descoteaux Boutiques wasn't notified until April 22nd of this year. As Scott Michelman of Public Citizen points out in his response (below), that's rather hard to believe. The news was everywhere. And there's plenty of evidence that indicates someone involved with KlearGear knew things were swiftly moving from bad to worse to actionable. Someone answered Matt Gephardt's email during his investigation and defended the atrocious policy. 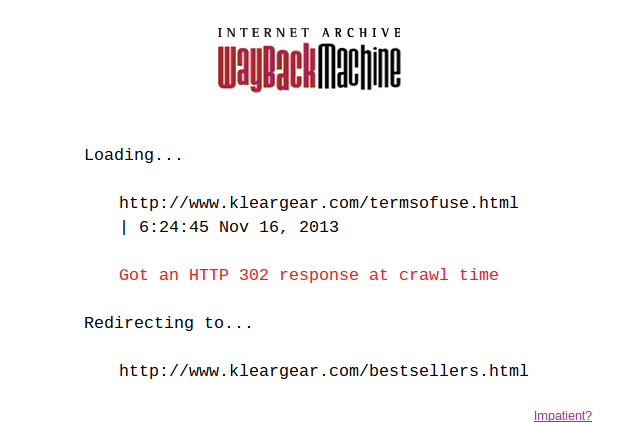 Someone running the KlearGear site scrubbed the TRUSTe certification KlearGear never earned off the site December 5th, roughly two weeks after it was first noted and called out. And, as the BBB noted, someone removed the false "A+" rating as well. Then there's the vanishing Non-Disparagement Clause as well, which was buried behind a redirect to the "Best Sellers" page. On Monday, several news outlets received a statement from the email address vic.mathieu [at] kleargear [dot] com making assertions regarding the lawsuit Palmer v. KlearGear.com, pending in federal district court in Utah. The email’s accusation that, as the Palmers’ attorney, I misled the court about KlearGear’s whereabouts or about any aspect of service, is entirely false. In accordance with applicable federal and state rules of procedure, we served the Palmers’ complaint on KlearGear at the Grandville, Michigan, address listed on its website, as documented in papers filed with the court and as confirmed by the court’s own judgment. The email’s statement that KlearGear lacked notice of the case is difficult to believe, given the widespread national and international press coverage over six months and the fact that news reports from the fall of 2013 contain statements from KlearGear itself regarding the Palmers. Additionally, the email acknowledges that the author was aware of the litigation a month ago. Yet the company allowed the case to proceed to judgment, making no effort during that time to move the court for relief from default. Most important, Monday’s email does not answer the claims at the heart of this case: that KlearGear used one-sided contractual fine print to try to bully unsatisfied consumers into silence, abused the credit reporting system when the Palmers would not pay KlearGear’s extortionate demand and then defamed the Palmers in the press. If KlearGear decides to appear in court at long last, we welcome the opportunity to demonstrate that the Palmers are entitled to relief, either because of the company’s default or on the merits. As Mathieu states in his email, people who don't like KlearGear's Terms of Sales can always shop elsewhere, which has always been true. (And I can't think of a single reason why anyone would shop there going forward…) But that sort of statement means nothing when the company blindsides people with Terms of Sales that weren't in place when the order was in the process of being ignored by KlearGear. Scott Michelman of Public Citizen, which is suing KlearGear on the customer's (Jen Palmer) behalf, reports that one of the defendants (Fidelity Information Corp.) has fixed its contribution to Jen Palmer's woes. Our suit also named the debt collector Fidelity Information Corp., who by this point owned the debt. Now Fidelity has done an independent review of the case and reported to the credit agencies that the debt was erroneous. So the Palmers have a measure of relief – the KlearGear debt is off John’s credit report, finally, after 18 months. Today the Palmers voluntarily dismissed Fidelity from the lawsuit. That's good news for the Palmers, whose credit was damaged enough by KlearGear's fraudulent tactics that it prevented them from getting a loan to purchase a new furnace when theirs broke, as well as hampering their efforts to buy a new home. That just leaves KlearGear, which has yet to respond to the lawsuit Public Citizen filed more than two months ago. KlearGear's social media accounts remain shuttered and silent. The company, however, remains open for business, however, with whoever's behind it presumably revising future earning estimates. We've written a couple times about the online retailer KlearGear and its stupendously ridiculous policy of inserting a "non-disparagement clause" in its terms of service, which claims that if you say something bad about the company online, it can fine you $3,500. This is exactly what KlearGeaer attempted to do to John and Jen Palmer. There were all sorts of problems (even beyond the obvious) with this, which we'll get to in a moment. A few weeks ago, we noted that Public Citizen, now representing the Palmers, had issued a demand letter to KlearGear, demanding that the company clear up the Palmers' credit, which the company had ruined, promise to stop using the non-disparagement clause, and to pay up for the serious difficulties created for the Palmers' by KlearGear's illegal stunt. Kleargear's response was to ignore the letter. The non-disparagement clause didn't even exist when John Palmer placed his order. He ordered in 2008, and it did not appear in KlearGear's terms of service until 2012. KlearGear never actually delivered the product that Palmer ordered. The negative review on Ripoff Report appeared to be an accurate complaint about KlearGear's customer service. John Palmer, who made the order, was not the same person who wrote the review. That was Jen Palmer, his wife. Even if the clause had been in there and had been binding, it would only have been on John. While KlearGear claims that John telling Jen about the problems still made him liable, that's just crazy. Even if the clause had been in there, it's completely unenforceable. You can't bar someone from giving an honest review of your crappy service. Palmer explained to KlearGear that Ripoff Report does not allow the removal of reviews, so that demand was impossible. KlearGear not only demanded $3,500 and to have the negative review removed, it also told various credit bureaus that John Palmer owed them $3,500 that he wasn't paying, creating a serious credit problem for the Palmers. When the Palmers disputed the debt claim with the credit bureaus, KlearGear insisted that the debt was legitimate and added an additional $50, again pointing to their terms of service, which had a "chargeback/dispute policy." Yes, this is adding insult to injury. Not only do they tell credit bureaus of a bogus $3,500 claim based on a bogus unenforceable term in a contract that didn't exist at the time of the failed exchange, but they add to the debt when the Palmers contested it. I'm going to repeat that last point, because it's what shows how insane all of this really is. KlearGear failed to deliver a product, provided bad customer service, and then three years after all of this, the company added a "non-disparagement clause" to its terms, which neither of the Palmers agreed to. The company used that to demand $3,500 for the accurate review, then reported that bogus "debt" to credit bureaus for an accurate review of the company's own failures, based on an unenforceable term in a contract added years after the events took place. And then... it tried to charge even more when the Palmers fought back against the charge. As the lawsuit details, the impact on the Palmers' life over a product John ordered which was never delivered, was fairly immense. The unpaid debt on their credit report harmed their credit, made it difficult for them to get a (pre-approved) car loan, likely increased the rate they eventually paid for the loan, meant that American Express refused to grant Palmer a card, and left the couple without heat for three cold weeks, because they were unable to buy a new furnace on credit, after their old one broke. Since then the Palmers have decided not to get a home equity loan to fix up their home, fearing the credit problem, and even though they want to sell their house, they're afraid to even try, given these bogus credit problems. And KlearGear's response to all of this has basically been to stand by everything it did... and then to disappear when asked to fix it. We'll see how that plays out in court.